Valken Tactical. Battle Belt LC - Black - XL. Simple web belt threading system. Includes web belt. Being sold by reputable paintball dealer (PB Sports ). Plate Carrier LC Tan. BLACK 4 1 TACTICAL Paintball VEST Harness! This harness can carry 4-140 round pods(NOT INCLUDED) and a Tank (nearly anysize CO2 tank - big enough to hold a 2 Liter bottle of soda! (Bladders are not included.). ). This full MOLLE vest has enough space to mount everything a soldier needs on the battlefield. A heavy gunner can mount 4 of the 3 4 pod pouches to carry an unbelievable 28 pods, or almost 2 full cases of paint! Internal belt is not included. Condition is Pre-owned. A djustable vest w belt. Paintball Chest Rig With Magazine Pouches. 4 rifle magazine pouches. 2 large radio pouches on the end for larger accessories or extra room for paintball marker magazines. We do our best to process as quickly as possible. CAMO Paintball CHEST PROTECTOR. Provides great protection against chest and back paintball shots! CAMO Paintball. CHEST PROTECTOR. -Tough nylon, Exterior Layer - LIGHTWEIGHT BODY ARMOR. The photos shown are of the actual item(s) you will receive. Tactical Cross Draw Vest w/ Belt. Right side has 3 ammo pouches, above the ammo pouches, the right side has a large shell carrying pouch and a shooting pad. Left and right sides can be adjusted for width via drawstrings. Maddog's tactical milsim molle vest hauls it all! Perfect for Paintball, Airsoft, Milsim, Etc. Hauls it All - Heavy Duty Reinforced Molle System. Heavy Duty Reinforced Molle System. Manufacturer's warranty goes into affect thereafter. 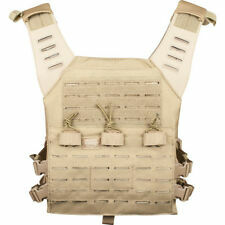 Paintball or Airsoft chest protector vest in excellent condition. Hardly used and clean. Size is 17" wide X 16" long. Can be adjusted via velcro. 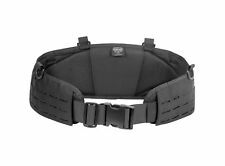 MOLLE Battle Belt - Black. Heavy Duty: Constructed by 1000D nylon, which makes this tactical use belt durable and comfortable. Quick Release Buckle for Easy Access: Highly useful for airsoft, paintball, military, shooting, hunting and other outdoor activities. ProToyz Chest Protector 5 in 1 Black. Loop to attach a Paintball mask. Integrated Neck Protector. Zipped accessory pocket. INSIDE BUTTONS MARKED. "UTX-102". NO OTHER MARKINGS. VEST IN ORIGINAL COMPLETE CONDITION. The Tippmann Arms Molle Tank Pouch. The perfect way to carry your tank when using a remote line setup. The pouch can be mounted horizontally or vertically. Fits standard MOLLE webbing. We also carry our own rapidly growing line of custom products including tanks, t-shirts, barrel covers, tech mats and goggle bags. JT Tactical Vest. I try my best to list flaws, if any. One Size Fits Most. Hydration Bladder Holder With Tube Guides. New vest Tippmann TMC mag holder black. Paintball Chest Rig With Magazine Pouches. 4 rifle magazine pouches. We do our best to process as quickly as possible. Subject to credit approval. Giant tactical Paintball Vest. Condition is New without tags. Shipped with USPS First Class Package. Most importantly, all of the Wicked Sports staff play paintball. All of our employees get out to the field as often as they can. We also carry our own rapidly growing line of custom products including tanks, t-shirts, barrel covers, tech mats and goggle bags. The sturdy nylon base of the vest is lined with soft foam that comforts the weight of your loadout and also serves as chest and back protection. This vest is a milsim tactical favorite! Can hold up to an 88CI tank. We will respond to your inquiry in 24-48 hours. SKU: VALKENVTACVESTZIPPCHTIGER. Hydration Unit Sleeve(Bladder not included). Being sold by reputable paintball dealer (PB Sports ). Woodland Camo. Deluxe Tactical Vest. Moveable Radio Pouch. Holds up to a 68ci tank. Pods and Tank not included! Length was adjusted to allow the DUTY Belt to sit at the waist where it belongs. Also, adjustable Velcro shoulders to fit any body size comfortably. Valken Tactical. Tango II M.O.L.L.E Vest. Being sold by reputable paintball dealer (PB Sports ). Really cool vest! I used it to play paintball a few times. All the pockets are hook and Loop closure and the zipper works perfectly. It has some light padding on the shoulder as well. Good overall condition. No size in the tag but it has 6 adjustable straps on the sides. At the biggest setting, it fits me and I wear a Size large shirt. So I'd say it is a youth/young adult vest (or anyone that wears a Size large shirt or smaller. Please see photos for details and let me know if you have any questions. Thanks! Maddog Full-Finger Pro Trio takes the PAIN out of Paintball! Maddog REVERSIBLE Padded Chest Protector. Maddog Pro Neck Protector. Maddog Tactical Full-Finger Gloves - Large / X-Large. Rubber Maddog logo. The Tippmann Chest Protector can worn under or over your shirt to provide the extra protection needed for any paintball player. Eliminates the impact of the paintball & protects the chest & back from welts. 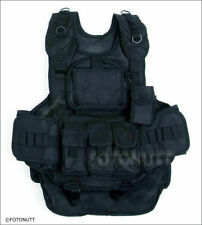 Tactical Airsoft Vest Black. Fits 2 pistol magazines Non Slip padded shoulder. Easy close zippered front Rear hydration pocket. Fits up to 4 M4 sized magazines. Being sold by reputable paintball dealer (PB Sports ). Paintball Chest Rig With 3 Double Magazine Pouches. We do our best to process as quickly as possible. Adjustable Waist Strap with quick connect buckles. (2) NXe Camouflage Paintball Vest (Pre-Owned). As-Is. Came from an estate sale. Looks to have been hardly used. Please look at pics and determine for yourself. Thx u for looking.